Little Buddy woke up with more than fifteen swollen and angry red bite marks on both his lower legs. It must be those dratted mosquitoes again! It broke my heart to see him scratching away in distress over the terrible itch afflicted on him. About a month ago, both Big Buddy and him were covered with numerous mozzie bites despite the installation of insect screens in our house and weekly fogging exercises at our estate. A call to the National Environment Agency revealed that a couple of breeding sites were discovered at a nearby vacant plot of land. A week after, there were still lots of mosquitoes around the estate and we resorted to ‘fumigating’ our home nightly with insectide and carrying out a witch-hunt for those pesky mosquitoes before we turn in for the night. It has minimised mosquito bites on the family but once in a while, one or two may elude us and they happily have a blood feast at night. Although the mosquitoes are not of the dreaded Aedes specie, they are huge and their preferred targets are my boys, not the adults in the household. I can sleep beside Big Buddy and not have a single bite while the exposed areas of his limbs are marked with bites in the morning. Subsequently, the bite site will inevitably break out in huge swollen patches because of the children’s sensitive skin. Checks with friends confirmed that we are not the only victims but apparently, there is a sudden proliferation of mosquitoes all over Singapore. 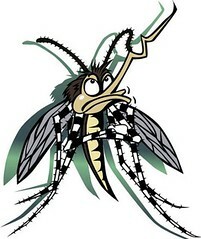 Urghh…I really really hope the mosquito situation will be resolved soon. was ist die Bedeutung dieses Wortes?